To all the mommas out there that have been up all night, or are having trouble consoling a crying baby, or are frustrated that there is sweet potato smeared in every crack and crevice, or are sad that it’s monday and that means daddy goes back to work…to all the mommas who just need a prayer, here you go. May God find you right where you are. I praise you for this new day. I praise you for our family and our children. I thank you for loving us so we can love others. God, I pray for mommas today. Give us the energy we need to keep up with our kids, and care for them and love them. Give us the patience we need to deal with tiredness, crabbiness, and perhaps even teething. Please God, give us the wisdom we need to teach our babies to love one another, to share, to know the difference between right and wrong, and to follow Jesus. Guide our words, may they be filled with grace, peace, kindness and unconditional love. And God, please remind us that there is joy in every day, even when it doesn’t seem like it. There is joy in Jesus, thank you for your Son! 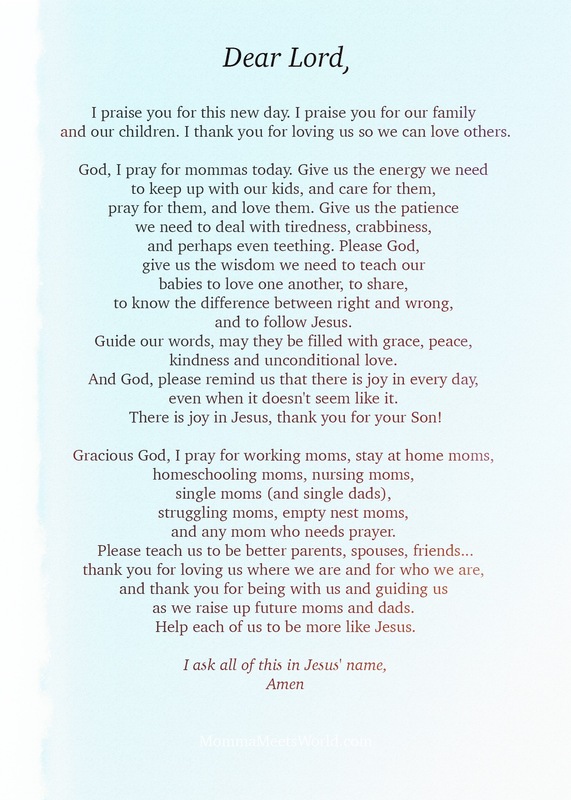 Gracious God, I pray for working moms, stay at home moms, homeschooling moms, nursing moms, single moms (and single dads), struggling moms, empty nest moms, and any mom who needs prayer. Please teach us to be better parents, spouses, friends…thank you for loving us where we are and for who we are, and thank you for being with us and guiding us as we raise up future moms and dads. Help each of us to be more like Jesus. If this has been an encouragement to you, please pass it along for other Mommas who might need the same encouragement. And feel free to save the image below so you can pray this prayer every day. This entry was posted in Uncategorized and tagged joy, mom, momma meets world, motherhood, parenthood, parenting, patience, prayer, praying, wisdom. Bookmark the permalink.